The Noco Genius Boost GB30 jump starter200 amp (400 amp max) lithium ion portable jump starter has a single USB output. Included are battery clips and a built-in LED light. 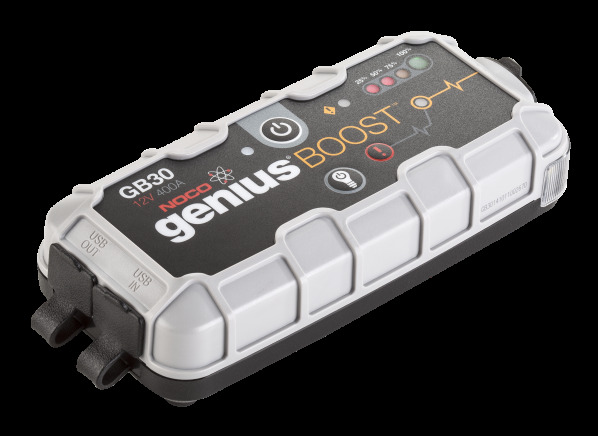 The Noco Genius Boost GB30 is part of the Jump starter test program at Consumer Reports. In our lab tests, Jump starter models like the Genius Boost GB30 are rated on multiple criteria, such as those listed below. Jump Start (Warm): Ability of the Jump Pack to start a weak and dead battery at warmer temperatures of approximately 70 deg. F. A weak battery is when the headlights will come on and the engines starter motor will click but not start the car. A dead battery is when the lights would not come on and the starter would not make any noise. Jump Start (Cold): Ability of the Jump Pack to start a weak battery at Zero degrees. A weak battery is when the headlights will come on and the engines starter motor will click but not start the car. Starting a car at sub freezing temperatures is most severe since the battery loses capacity. The test was done with both the cars battery and jump pack at zero degrees and with the battery at zero degrees and the jump pack at room temperature. Reserve capacity: Reserve capacity estimates how long the Jump Pack can be used to power other electrical equipment such as charging cellphones and laptops. USB ports USB ports The number of USB charging ports provided. Cell phone connectors Cell phone connectors The number of brand specific cell phone charging connectors provided. Laptop connectors Laptop connectors The number of brand specific laptop charging connectors provided. Warranty (mos.) Warranty The length of time the Jump Starter is covered by its manufacturer. Temperature range (F) Temperature range Maximum temperature the manufacturer recommends using or storing its product. During the hot summer months, consider storing the unit in a cool location and only taking it with you on long trips. If you are storing the unit in the car, choose a location out of direct sunlight, such as the glove box or the trunk.